We’ve been trying out adjustables glasses. Named adjustable not because you can change the fit but instead you can change the actual lens to suit a wide range of prescriptions. That means they could be shared as a “spare pair”. Here’s what we thought. As we get older most of us become more dependent on aids to help us see. Playing hunt the specs or having to make rapid appointments to get broken pairs fixed becomes a way of life. Adjustable eyeware may be a short-term answer. 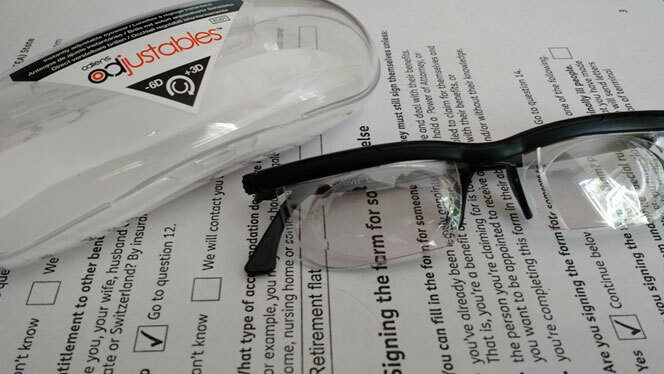 We tried the adjustable glasses from Adlens. Each lens can, as the name suggests, be adjusted to anything between -6D and +3D. How? The user simply turns knobs (or dials as the blurb would have it) at either end of the lenses. If you’d like more information on just how that works, there’s a more detailed explanation on the Adlens web site. So there could be a single pair in the house that anyone could use in an emergency when they’ve lost or broken their specs. As a short-sighted contact lens wearer who’s also now in need of reading glasses I thought I’d make a good first guinea pig myself. Here’s what I found. First thoughts. The case is plasticky and doesn’t seem very strong. The glasses appear to be all plastic too, making them very lightweight but potentially easy to break. Ease of use out of the case. You do need to read the instructions to realise how you tune the specs for an individual’s eyesight. You cover one eye at a time and turn the dial, which is fairly easy if your hands are reasonably deft. It felt like it would be easy to over-wind the dials, but it didn’t happen. You may need the specs to read the instructions as it’s not intuitive, so best to work out how to use them before you need them. Suitable for? Long sight and short sight but not astigmatism. That might be an issue as most people I know seem to have been told they have astigmatism to some degree. Looks? Hmm. The lenses themselves are mostly rimless but there’s a large bar going across the top that holds the mechanism to dial up and down the lens. Not hugely good-looking but not deeply embarrassing either. And there is a range of frames available. Vision. I tried these first as reading glasses. I couldn’t quite get the vision right, which is surprising as my reading vision isn’t too bad yet. On the other hand with a bit of adjustment they were quite handy for sharpening up the words on my PC screen. They worked pretty well for myopic vision too although the actual field of vision is smaller than usual. I wouldn’t want to wear them long term, but that’s not what they’re meant for. Useful for an older person? Next reviewer was my 93-year-old father. I thought long and hard about asking him to try these out as new things can confuse him sometimes. It was a good day though so I asked him to help with an experiment. As dad’s hands shake a bit now and he does have a bit of trouble following new ideas I actually did the setting up while he told me when the world had come into focus. That can’t have taken more than a minute, after which he was sufficiently happy with them he asked me to put them in the drawer as his second pair. That could have been the end of this review – but ten minutes later he remembered he had a spare pair anyway and relinquished my Adjustables back to me. This from a man who thinks that even putting his hearing aid in these days is too complicated is praise indeed. Yes, I took these specs to the pub and tried them on a couple of friends with interesting results. They both dialled the lenses into a view that worked for them almost immediately. One, who normally only uses reading glasses, professed that she could see much better all round by changing the settings, so she may be off to the opticians in the near future. That said, no one felt they’d really want to go out and about in these – they do look pretty weird. Adjustables are marketed for short-term use and that’s where their strength lies. It’s suggested you could swap them for contact lenses if you were waiting for surgery, but I’m not sure I’d want to wear them for weeks. I’m concerned that the field of vision may not be large enough for driving and you wouldn’t buy them for their looks. However, these specs could make a very useful spare pair for one person or in a household where there’s always someone who can’t find their glasses. Why not join the family? 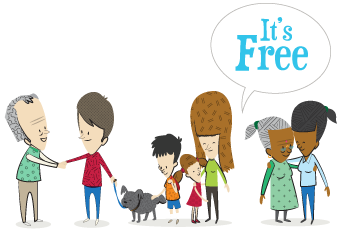 If you’re not already signed up for our newsletter you’re missing out on free articles and tips around quality of life for older people. Just click the box below to join us.